How big of a problem is tuberculosis? Not only is tuberculosis (TB) the deadliest infectious disease in the world – it killed an estimated 1.7 million people in 2016 – we are also losing ground to resistant forms of the disease. While effective treatments for TB exist, drug-resistant TB is too often fatal. What is MDR-TB, and why is it such a problem? A typical form of TB requires a six-month treatment regimen comprising four different antibiotic drugs. But more and more often, this standard regimen isn’t working: the drugs are not effective against resistant forms of TB. The endTB project focuses on MDR-TB and XDR-TB – find out how here. The problem is growing. According to WHO estimates, there are 600,000 new patients eligible for MDR-TB treatments each year, and one person infected with MDR-TB is likely to infect a further 10-15 people in a single year. Do TB and MDR-TB spread the same way? Yes. Airborne bacteria spread when a person with infected lungs speaks, sneezes or coughs – especially coughs. People can become infected when they breathe in the bacteria. This often happens after prolonged and close contact with someone who has developed TB. The risk of transmitting the disease is drastically reduced for patients under an effective treatment. What are the symptoms of MDR-TB? The general symptoms are the same as TB’s. They include weight loss, fever, night sweats and a feeling of weakness. When TB affects the lungs – which is the most common (and virtually the only contagious) form of the disease – it often causes chest pains and coughing up blood. Very often, TB continues to be diagnosed as it was a century ago: sputum samples are examined under a microscope for signs of the tuberculosis bacillus. The most reliable test of this type takes two months. In many countries, this was complicated further by the lack of laboratories equipped for TB diagnosis, meaning samples needed to be sent overseas. Because of this constraint, the disease often goes undiagnosed. More rapid tests have been developed in recent years. This includes a promising technology called Xpert MTB/RIF, which can test for the presence of bacteria in less than two hours. It can also test for resistance to rifampicin, one of the main TB drugs — in other words, it helps to diagnose DR-TB. The Xpert MTB/RIF is not yet a ‘point of care’ test, as it requires constant electricity supply and air conditioning. However, it has facilitated the diagnosis of rifampicin resistant TB at district level. The next generation of Xpert or other rapid molecular tests should allow further decentralization, and testing for resistance to other TB drugs. 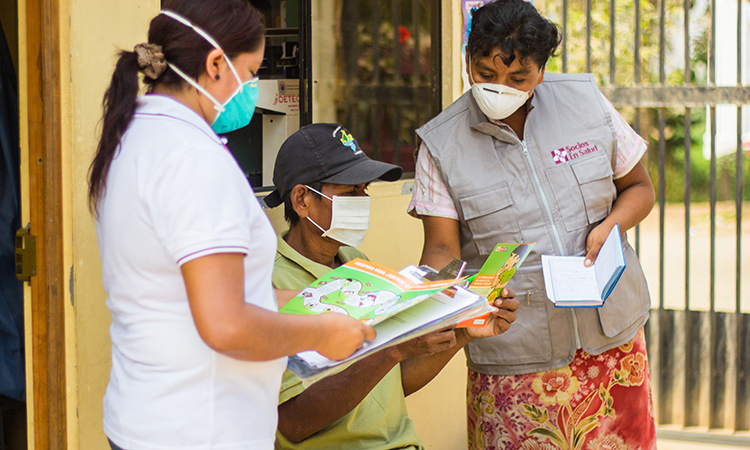 Diego,* a patient with TB, receives advice and treatment from Verónica Quispe, a community health worker, and Yecela Rodríguez, a field technician, at the Punchauca Health Center in Carabayllo, Peru. Can we vaccinate against TB and DR-TB? How does drug resistance happen? When a person is infected with an already drug-resistant TB bacteria. If the drugs don’t work, how can we treat the disease? Often we can’t: the world isn’t prepared for MDR-TB. Of the 600,000 estimated patients eligible for MDR-TB treatments in 2016, only 129,689, or 22%, ever received appropriate treatment. And for those people, the ordeal of MDR-TB doesn’t end at the symptoms. Because the disease resists the most effective drugs against TB, patients face poor treatment options. It’s common for people to give up before the end of their treatment. Moreover, these treatments only cure around 54% of patients. This means only 11.9% of all estimated MDR-TB cases can expect successful outcomes. Because the drugs are more toxic and less effective, and the disease is often more advanced by the time patients receive proper treatment (if they do), MDR-TB often leads to death. What are MDR and XDR-TB resistant to, exactly? MDR-TB is caused by bacteria that are resistant to the two most important drugs in the standard regimen, isoniazid and rifampicin. Patients usually have to be treated for 18-24 months, with regimens containing at least five drugs. In XDR-TB, which represent an estimated 6.2% of MDR-TB cases, but can be as high as 25-30% in some countries (such as Belarus, where endTB works), the bacteria resist the two most important drugs in the standard treatment and the two most important drugs in MDR-TB treatment. These patients often receive treatment for 24 months, again with regimens containing at least five drugs, many of which are very toxic and of questionable efficacy. Cure is assured in even fewer of these patients – only 30%, according to the WHO. How big a problem is MDR-TB? And where? All signs point to a growing global burden of MDR- and XDR-TB. And even though MDR-TB cases only account for 4.6% of total TB cases worldwide, the prevalence of TB explains why we are seeing more than half a million new MDR-TB cases each year. In Africa and Asia, percentages are low. But the HIV epidemic in Africa leaves millions exceptionally vulnerable to TB, and to repeated bouts of TB or MDR-TB. In Eastern Europe and the former Soviet Union, absolute numbers of TB cases are low, but the percentages of resistant TB cases are extremely high. 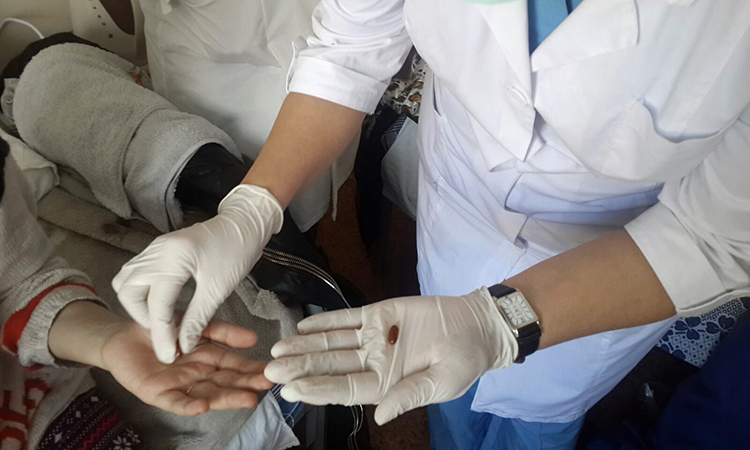 The first patient takes the very first dose of Bedaquiline in Almaty, Kazakhstan. Why are we still using toxic, ineffective drugs against drug resistant forms of TB? TB experts only began to appreciate the scale of DR-TB in the ‘90s. It was not widely considered a global health issue until the ‘00s. By definition, there were no readily available drugs to tackle it. Nor was there any research, or breakthrough, in TB treatments for almost 50 years. The drugs used to battle DR-TB are old, toxic and often re-purposed from treatments for other diseases. Treatments vary from one region of the world to another – in total, we estimate that more than 20 different drugs are being used against MDR or XDR-TB. The treatment regimens have one thing in common: they simply aren’t effective or user-friendly enough to contain the disease. What is a treatment regimen? A regimen is the combination of drugs a patient will be given to treat the disease. Because of a lack of TB research, and because drugs work differently for different people, it is not clear what combination of drugs work best for any given person. endTB is designed to reduce this evidence gap. Have there been breakthroughs in the fight against MDR-TB? Yes. One of the most encouraging breakthroughs is the arrival of two new drugs in recent years: bedaquiline (manufactured by Janssen) and delamanid (manufactured by Otsuka). These are the first drugs developed for TB in almost 50 years. This is especially encouraging for treatment of drug-resistant forms of the disease. There is hope that these new drugs can lead to better treatment outcomes, and the research conducted so far indicates that they are effective. Both drugs are already approved and marketed in some developed countries. One of endTB’s goals is to expand their use. At present, less than 5% of patients who could benefit from these drugs have access to them – and as a general rule they reside in affluent countries. Another important goal of endTB is to improve treatment regimens. The focus of manufacturers is to bring their individual drugs to market. What the market lacks, however, is more evidence to show how to best use different drugs in combination. Because we lack the evidence on the optimal use of these drugs, we also don’t know the scale of the market demand for them, and how many patients worldwide could benefit from them. In other words, building evidence of new and improved treatment regimens will influence market demand, and help to make those drugs accessible to patients. Find out more about endTB's approach on the About page.